Beautiful Interlachen is a great base for exploring Switzerland! My husband and I spent our honeymoon here and took many day trips. This Bernese Oberland area is a great choice for European vacations. We had a Swiss Pass and used the included train, bus and boat to see many Switzerland attractions. Swiss Rail travel from the busy and centrally located Interlachen Train Station makes it easy to travel near and far in Switzerland. We also took some Swiss Hikes in the mountains near Interlachen, taking the chair lift up and hiking down. If you prefer a larger town with more shopping, hotels, restaurants for your Switzerland Holiday, Interlachen is a good choice. Make sure and take side trips to nearby Lauterbrunnen and Murren. These two towns, in my opinion, should not be missed. They are two of my favorite places in the world! More information can be found below and on my separate pages for Lauterbrunnen and Murren. Take the Swiss train to Grindelwald and enjoy its setting at the foot of the Eiger. Down the mountainside to Lauterbrunnen, a lovely narrow town set below a majestic waterfall. Both Wengen and Lauterbrunnen are worth a stop just for the sheer majesty of their scenic beauty and spectacular settings. Take the funicular from Lauterbrunnen up the steep mountainside to Grütschalp. Hop the train at Grütschalp that takes you across the mountain ledge to car less Murren and its breathtakingly beautiful setting on the edge of the mountain. 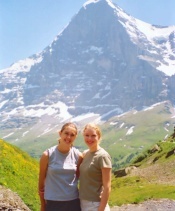 Have a coffee or maybe a picnic on the mountainside and drink in the fantastic views of the Eiger, Monch and Jungfrau. Take the cable car up the Schilthorn, where you will feel like you are on "top of the world"! Take the cable car back down to Stechelberg, on the valley floor, passing Gimmelwald (Rick Steve's favorite). 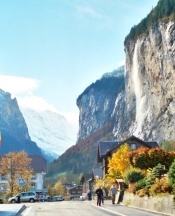 Take the bus back to Lauterbrunnen, with a possible stop at fascinating Trümmelbach Falls. 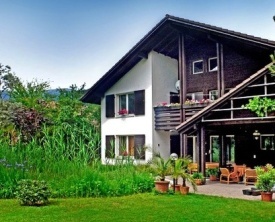 Check out a holiday apartment Interlaken below. Click on the picture or name to get detailed information or email the owner. Nice house with 2 apartments (one the owner's), in the district of Matten, 2 km from the centre of Interlaken, in a quiet, sunny position in the residential district. 1-room apartment 24 m2, on the ground floor, cosy furnishings: living/sleeping room with 2 beds, dining table, cable-TV and radio. Kitchenette (2 hotplates, oven). Shower/WC. Patio. Terrace furniture. View of the countryside. Please note: only 1 dog accepted. Very reasonable rates. 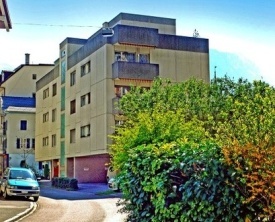 Apartment house, in the resort, 100 m from the centre. In the house: lift. Grocers 50 m, supermarket 600 m, restaurant 50 m, bus stop 200 m, railway station "Interlaken West" 600 m, swimming pool, indoor swimming pool. 2-room apartment 56 m2 on 2nd floor, renovated in 2007, modern furnishings: living/dining room with dining table, cable-TV, radio and CD-player, exit to the balcony. 1 room with 1 double bed (160 cm). There are many hotels to choose from for your Interlachen Swiss vacation including very elegant, deluxe hotels to smaller Inns. Check out this powerful search engine that checks 120+ Hotel Websites for the best prices on Hotels in Interlachen. Check availability on all of the above hotels and more and see photos, reviews and the cheapest rate for each hotel. If you are looking for budget accommodation for the lowest price including hostels, guesthouses, apartments, campsites for camping and more....try the search box below. You can also check out Interlaken Tours. Have you been to the Bernese Oberland before? Do you have a favorite town, hotel or attraction that everyone should know about? When you return from your getaway, tell us about it. Review the destination, lodging, attractions, restaurants and/or share a photo. Please share your comments or reviews (good and bad!) by clicking on this link. We look forward to hearing from you!